This match will be played between SKN vs TKR. This is CPL T20 (Caribbean Premier League), 2018. Sandeep Lamichhane is not available now. He returned for national duty. Rassie van der Dussen joined the team. Probably he will play in the lace of Tom Cooper. Chris Gayle will lead St Kitts and Nevis Patriots (SKN). Probably Chris Gayle(c) & Evin Lewis will open for SKN. Chris Lynn returned to Australia to prepare domestic ODD cup. So don't take him. Trinbago Knight Riders (TKR) is a good and balanced team. Probably Sunil Narine & Brendon McCullum will open for TKR. In WK Devon Thomas & Denesh Ramdin both are the good options. This match will be played at Warner Park, Basseterre, St Kitts. The pitch will help batsmen. There is some help for bowlers also. 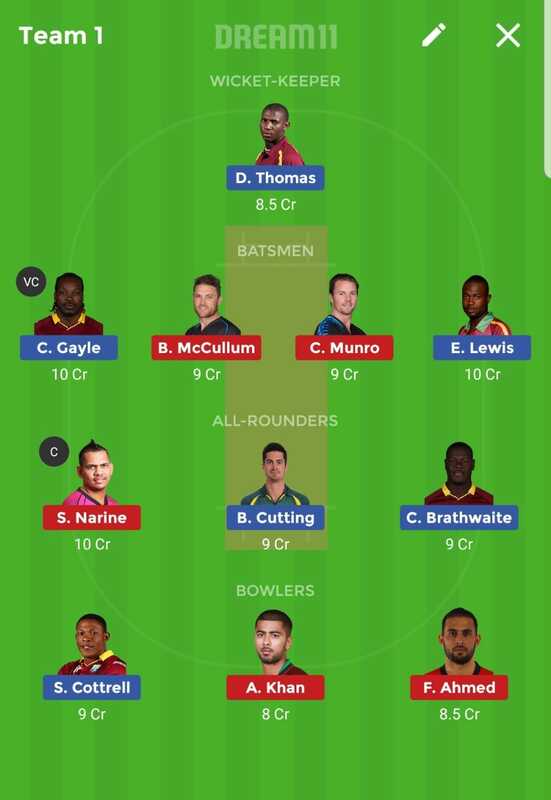 SKN vs TKR dream11 Fantasy Cricket Tips -. Fantasy Cricket Tips - Both are the competitive teams to make a balance fantasy team.